The Student Response System (SRS) allows instructors to pose questions and gather students' responses during a lecture. Student response systems are also commonly referred to as clickers, classroom response systems, personal response systems, or audience response systems. At Northwestern, faculty members have two options for the SRS: a TurningPoint device or mobile. The TurningPoint device includes the "clicker" (for the student) and and a receiver (for the instructor); the mobile platform allows students to respond using their own networked devices such as laptops, tablets, or smartphones. The instructor creates interactive presentations on Turningpoint software installed on their computer. During class, students respond to the questions or problems posed in the presentation by using their clickers or mobile devices. The receiver on the instructor's computer gathers the data and can display summaries of students' responses. Answers are also stored electronically for later viewing. 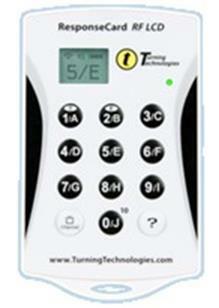 A receiver is required to collect the data from the Student Response System (clickers). Receivers are available to instructors directly from the vendor, Turning Technologies. Instructors may also ask for an Instructor Kit, including a receiver and a QT2 clicker. There is currently no charge for an Instructor Kit. Instructors who wish to request an Instructor Kit may contact Northwestern's account representative, Jessica Stickle, at jstickle@turningtechnologies.com. Northwestern has implemented standardized support of software from Turning Technologies, LLC to ensure that that the University community receives a quality product and that students will not need to purchase multiple clicker devices for different courses. 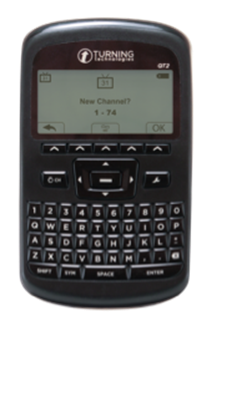 The QT device features a full QWERTY keypad and a large LCD screen. Students may purchase a QT Device at the Norris Center Bookstore located in The Norris Center on the Evanston campus. A lightweight device with a simple design. No learning curve required to start using this clicker. Available for purchase in the Norris Center Bookstore. A polling application which allows participants to use mobile devices, including tablets, smartphones, and laptop computers. Keep in mind that the classroom must have enough wireless connectivity to support all the students. Students must register and purchase a subscription in order for their responses to be tracked by the instructor. Students should check with their instructors that they may use their mobile device in class.